During the 2006 holiday shopping season many US consumers walked out of stores without buying what they wanted, with many giving thought-provoking reasons for their abandonment of the store, according to survey by Deloitte & Touche. The survey found that consumers are generally becoming more surgical in their approach to shopping, and are increasingly using online shopping and pre-shopping techniques. In the survey, many said they were unable to buy (or they chose not to buy) a product because of poor customer service, a confusing store layout, or because the item they wanted was simply out of stock. dmeacham This article is copyright 2007 TheWiseMarketer.com). 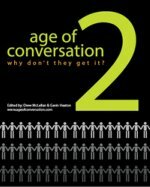 32% said a sales associate could not answer the question they asked. Streamlined, intuitive store navigation also improves conversion. In the survey, more than a quarter (26%) of respondents said they walked out of a store without buying because the store layout was too confusing. The survey showed that two-thirds (66%) of store visits this holiday season were not influenced by marketing and advertising. Most consumers said that they shopped in specific stores because they were familiar with the store or they were passing by, not because of advertisements, sale notices, email reminders, or other advertising or marketing. Apparently, consumers visit stores because of brand recognition and past in-store experiences. Retailers that consistently deliver successful customer experiences and fulfil their brand promises create strong retail brands and loyal customer bases. Some two in three consumers surveyed (63%) did an online search for product or store information before visiting a store. Almost half of consumers (48%) read online consumer-written product reviews, at either a retailer site or a non-affiliated site (like a magazine website or social website) to help decide whether or not to buy a product, or which product to buy. Almost all (90%) of these said that the reviews were helpful in making a purchase decision. It is clear then that retailers that provide rich multi-channel resources are more likely to attract customers and win their loyalty. In addition, multi-channel retailers may prove to have a distinct competitive advantage over online-only retailers, since the multi-channel brand will have the opportunity to develop more frequent customer contacts. 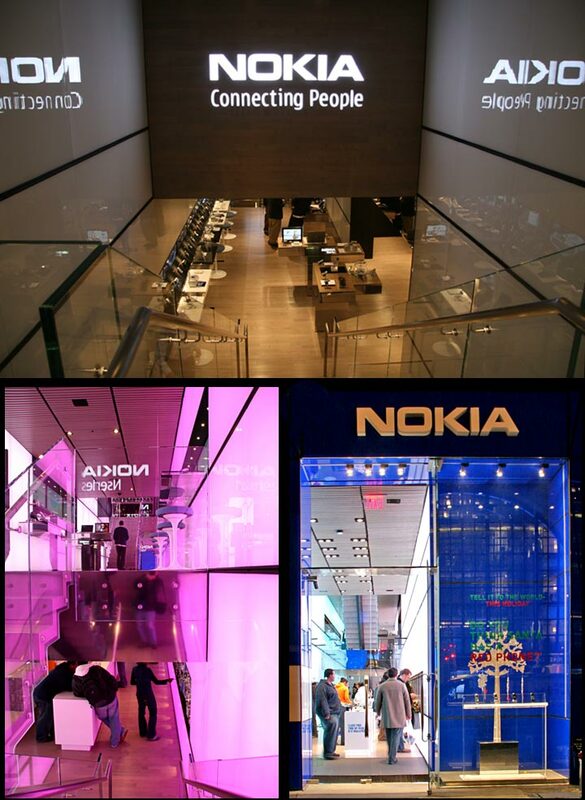 As promised, here’s my take on the Nokia store on 57th street, Manhattan. First off, while the Apple store around the corner is a futuristic, the Nokia store makes it look like the Little House on the Prairie. The building’s peacock-blue facade, one of the few parts of the store you cannot interface with, seems to be made out of gigantic plastic pieces from an educational toy. With neighbors like Bulgari, Burberry, Louis Vuitton, Prada and Tiffany, the flagship store appears to be less about actual retailing and more about exposure. Click here for more photos. Inside the narrow, three-level, two-thousand-square-foot space, luminescent Plexiglas walls and Barry White-inflected music make you feel as if you’d walked into an airport cocktail lounge. Should you wish to change the color of the panels from magenta to cyan or any of the other sixty choices, sit down on a bar stool, pick up one of the cell phones attached to the counters that flank the room, and send a text message to the wall. You can also click to control the images on screens, to switch, say, bubbling bubbles to alphabet letters blowing in the wind. Or you can send a note to the walls in any of the other five Nokia stores in the world. You can also walk upstairs, snap a picture of yourself with the superb optics built into the N93 phone, and print a copy of it to take home (note to Samsung….). The first floor contains the main collection of devices, while the second floor holds the NSeries and the tiny third floor is reserved for the exclusive Vertu boutique ($4,500 – $150,000; for a phone, service plan is extra). The second floor resembles the first, with digital panels and high interactivity. Vertu is a jewelry store experience; all phones are under glass and and must be shown to you. I visited about 15 retail destinations on my recent trip. While the Apple store was the one where people were most actively engaged (duh), for me, it was the Nokia store that offered the experience that made me want to know more about their products. It was an “entertainment experience” that was totally engaging. During my trip to NYC this week, I spent a day visiting a number of retail “flagship”and concept stores. Obviously the Apple store on 5th Ave was on the list and it was everything the hype promised. 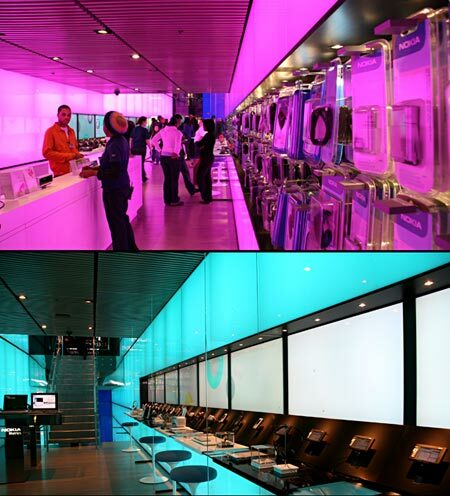 The last “store” that I visited, was the Samsung Experience located in the Time-Warner Center at Columbus Circle. In today’s rant, I want to share some thoughts on how these two companies approach customers. I am a tourist’s tourist with the camera always on (and flash off so that I don’t annoy others). I like to capture my trips so that I can share with others. As we all know from the exploding growth of social media, I am not alone here. Walking through the Apple store, I took over 100 photographs and recorded videos of their digital signage. I was approached by several Apple employees, each asking me if I had any questions or if I needed help with anything. Not once was I asked to stop taking pictures. The store actively promotes hands-on interaction. Apple clearly understands that the customer is in control and they are there to help them achieve the things they want to do, including taking photographs. They know those photos will likely end up on the net, and they don’t see that as a problem. For Apple, the store belongs to the customer and when I was there, the customers were having lots of fun! I should point out that I also had free reign at the Nokia store, which was by far the most engaging experience of the trip. I’ll save the details for a later post, but the people that worked there were actually assisting me in getting som of the shots that I wanted! The Samsung Experience was something completely different. An absolutely beautiful space, the Samsung experience draws you in with a giant touch sensitive table in the atrium outside the doors, which displays interactive maps, RSS feeds, and videos of New York neighborhoods. From the outside, you can tell that Samsung has spared no expense on this venue. They have the latest in technology that the average consumer hasn’t even dreamed of and it’s designed to be interactive with audio walking tours. Its a museum for high tech consumer electronics, and when I go to museums, I take my camera. Unfortunately, Samsung doesn’t want you to capture digital memories of their “experience”. I was able to capture only one picture before I was quitely, but firmly told that picture taking was not allowed. I wasn’t greeted or asked if I could be helped; I was just told to stop. I explained that I worked for Circuit City (a very big customer of Samsung’s products) and that I wanted to share their concept store with my co-workers. To that, I was handed a business card that gave the URL for the store’s website. I was told that there were pictures there, but a subsequent check of the site proved that statement to be false. Great “Experience”. After this encounter, the biggest thing that I noticed (besides the 80″plasma) was that the “Experience” had all this technology in it, but very few people. The Samsung Experience clearly operates on a different business model than Apple or Nokia. Their focus is on their products (look at us, aren’t we cool). Apple’s focus is on the customer (let us help you to get the most out of whatever you are passionate about). Ironically, Samsung sells all kinds of products that capture pictures and video, but won’t allow you to use those devices inside their “Experience”. Apple doesn’t sell cameras or picture phones (yet), but they don’t have any problem with you using them in their store. The bottom line is that Samsung doesn’t really get the whole “customer is in control”, social media thing. I walked into the store really excited about “experiencing” the store, but after being challenged, I had very little desire to spend any more time in the store. I made a quick pass through and left. That’s unfortunate because the store has the potential to be really great place. 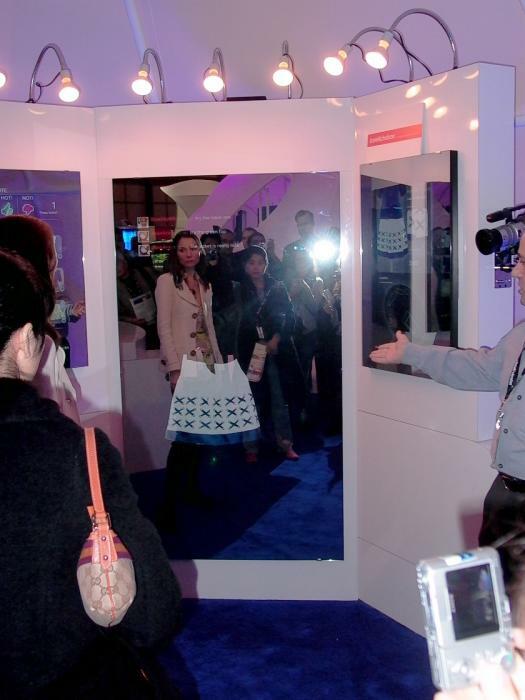 Picture this, ladies… You walk into the store and go straight to the big mirror with the touchscreen panel beside it. You select select 30 different clothing items from the touchpanel and then stand on the big spot on on the floor. As if by magic, the first pair of jeans that you selected appears in the mirror right over your reflection giving the illusion that you are wearing them. They look ok, but you aren’t sure. Not to worry as you asked some of your BFFs to join you online. That image in the mirror is also showing up on your page and your friends can vote up or down on each selection. In fact, anyone who is a friend on MySpace, Facebook, or any other social networking site for that matter, can weigh in on how those new jeans look. They can also IM you through the mirror. But wait, there’s more… They can also pick out other pieces for you to try by selecting items from the store’s online catalog. Those new items now appear on the touchscreen panel. After you’ve sampled all the pieces, you can actually try on just the ones that your friends say looked the best on you. There are also RFID and data-mining components in the system that help retailers monitor inventory in real time and collect data that provides valuable insight into customer mindsets, behaviors and evolving needs. I saw this bit of technology at the National Retail Federation’s Store of the Future – X07 display at their conference in NYC. It’s the brainchild of IT Services company IconNicholson and they call it “Social Retailing”. Clearly, IconNicholson understands that today’s youth is hyper-connected and extremely social. They are always traveling in a group, either physically, or virtually via phones and IM. They also understand that tech-savvy young consumers can be compulsive shoppers who look for validation and approval by their social groups for their purchase decisions, especially regarding soft lines. It’s Facebook meets the Mall and it’s a capability that is available using today’s technology. There’s bound to be a fair amount of complex code behind the scenes to make this work, but it clear to me that the retailer that pulls off social media shopping and couples it with IT systems will have quite the competitive advantage. I’ve been meaning to write this for weeks. Thankfully, Randy Saunders over at the Perfect Customer Experience has done much of the work to make my case in his recent post. The focus of this rant is Macys, or more accurately, Federated Department Stores, who in 1994, acquired the brand. Shortly after, they began the process of rebranding all their other holdings to the Macy’s name in order to facilitate a national brand advertising strategy. Macy’s had been through rocky times in the 80′ and eventually filed for bankruptcy in 1992. Nevertheless, millions of Americans who lived in markets served by one or more of Federated’s other brands, typically viewed Macy’s as something more than the mid-level department store that it really was. Chalk this mystique up to the annual Thanksgiving Day parade which prominently features their Herald Square flagship store. To those folks who had never been in a Macy’s, this magnificent store was Macy’s. I live the mid-Atlantic, where the Hechts brand has ruled for many years. In 2006, we learned that our Hechts were to become Macy’s. Unfortunately, the change did not deliver something better than what we already had. I had hoped that the change would bring some of the higher end fashion lines that I had seen in the flagship store. No such luck. In fact, prior to the changeover, they actually began eliminating some of the more interesting lines of mens clothing in favor of more of the same conservative stuff that you can get anywhere in central Virginia, and house brands. I used to shop at Hechts frequently. Since the changeover, I have been in Macy’s twice and will likely not go back. A new report from Dana Cohen, managing director of Bank of America Securities reduced Federated from a recommended “buy” to “neutral,” in part because of flagging sales at Marshall Fields and other ex-May stores. Although Federated’s legacy Macy and Bloomingdale’s stores reported a 4.4 percent gain, the same-store sales at hundreds of former May Department stores were down by 11 percent. The report said some possible contributing factors included the sudden conversion of all May nameplates and changes in product assortments emphasizing Macy’s private brands and downsizing some national ones. “The key issue we are facing is that management miscalculated the impact of these changes,” said Cohen. Local brands under Federated worked. Tey were more expensive to operate with national brands and on economies of scale for national advertising, but the customers generally liked what they had. Federated’s strategy ignored the customer and the results speak for themselves. To many, the Macy’s name brought high expectations, but in the end, has not delivered and that’s how you destroy a brand.